I have been chosen. It is no joke. There was a Japanese woman yesterday at the lower gate of LAU, who gave me a book and said I can make peace. I usually don’t go to LAU on Tuesdays. But yesterday I went to help with the preparations for the Annual Theater Festival. I was almost at the lower gate when I noticed a travel suitcase outside. I thought it’d be for a student leaving to their country since the semester is over. Then I noticed this short woman carrying few books and wearing a badge around her neck. I know these types. I always see them around Hamra Street waiting for victims to approach then they either want you to donate for a cause or answer a survey. I am a Itani. Just saying. I saw the woman approach a student who just left LAU, but the student knew how to fend her off so she came back to the sidewalk. I noticed something strange, however. The woman seemed to be Asian from a profile view. I wondered, is it possible that Lebanese people are now using Asians for these jobs? I didn’t have time to wonder too much, though, because the woman’s next “victim” was none other than myself. She saw me and smiled. My smiley face. Grrrr. In my heart I decided that I will not surrender to this woman’s will to make me pay money if it is something I don’t want to pay for. Of course the part after the “if” was just to satisfy my ego, because I never succeed in escaping. – Hello, you speak English? May I speak to you for a moment? I said yes, sure. Like a Lebanese child, I always become happy when an older foreigner knows that I can speak English. She also looked older than my mother, maybe my grandmother’s age. And she was obviously not in love with the heat. – My name is Hayuko, I am from Universal Peace Federation. She showed me her badge. Like an authentic Lebanese I pretended to be interested. I knew Hala would be waiting for me with a “yell” at the very least for being late, while this Missus talks to me about World Peace. Try to give Hala THAT excuse! But, anyway, it was too late to run away. She handed me one of the books from her hand. – I am distributing this book here. I come from Japan, to make peace. 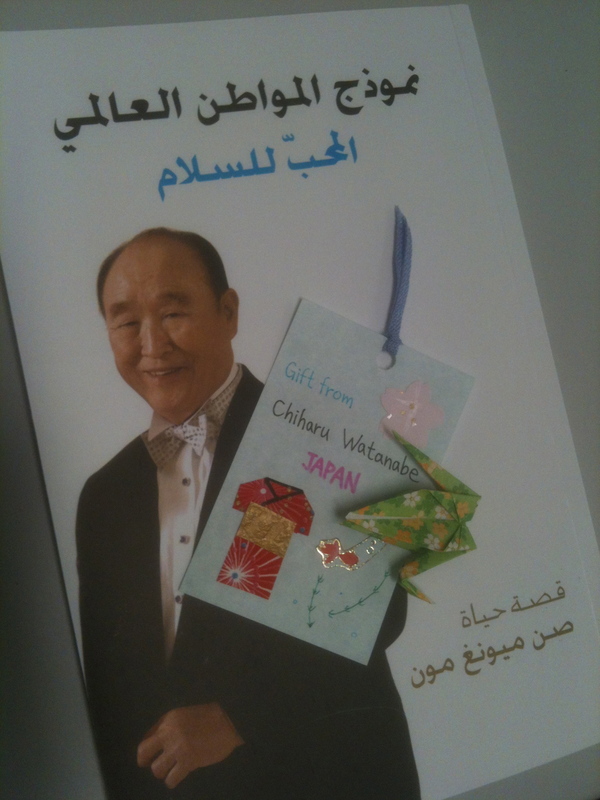 – “You came from Japan to make peace in Lebanon?” I laughed briefly but took the translated book nevertheless. She nodded. I don’t know if the Japanese humour is not similar to Lebanese humour or if she seriously thought she was going to make peace in Lebanon. Bottom line is I couldn’t help but respect her passion for peace -she was hopeful talking to hopeless. – And you think I’m going to read this book and make peace in Lebanon? You think I can make peace? Things were getting better, but my mind was now consumed with two things: 1- I am definitely getting yelled at by Hala for being late because of World Peace. 2- Is she trying to sell me a handmade card on top of the translated book about some peace making Japanese dude? I noticed that the woman’s family name was “Watanabe” and I wondered if she could be Ken Watanabe’s sister. I shuffled the pages of the book and started thinking of possible excuses. The woman also had started getting restless at this stranger who wouldn’t buzz off, I guess. She took another thing from her bag. – This is the Japanese symbol for peace. Her face lit up at my knowledge of Origami and she gave it to me happily. – Thank you! How do you say, thank you in Japanese? – Arigato, Hayuko. Ok, so are you selling this book or is it just something that I have to read then make peace? – No, no. I am not selling. You read. – Ok, so then do I have an assignment afterwards? Like do I have to write to somebody? I now know that this must’ve sounded like an idiot because I feel like an idiot and I remember that she looked at me like I was from outer space. Does this woman think that people don’t give books for free? Not in Lebanon I’ve never seen anybody give a smile for free, heavens forbid. – No, no. You just read for peace. – Ok, Hayuko. Arigato! Good luck! I walked in to LAU and went directly up to the Fine Arts. Good thing Hala had given up on me arriving on time so she was out of her office! But I was thinking, is the woman coming from Japan to ask me to make peace in Lebanon a good thing or a bad thing? And, out of all people, why me? Does she know that the thing that I want most in this world is to get out of here because of the absence of peace? Is that how messiahs are chosen? Like we write our protagonists? Identify their weaknesses. What is their darkest shadow, their biggest fear? Put them face to face with it. Make them arc. Our apartment is, as you probably know, in a Itani building. This building has a street, as you probably figured, in front of it. The street had been closed for about 7 years when it was partially re-opened in February 2012. For on this very same street there is also an entrance to the palace of our ex-prime minister Rafic Hariri who passed away BEFORE blocking the road. On the same street also, there is the lower gate to the Lebanese American University where I teach. But this blog post is not about LAU or Rafic Hariri, nor about the palace. This post is about the shops on this street, most of which had to shut down because of the blockade. They slowly closed, one after the other. Then the street became a haven for kids to play football in, in the midst of day – something miraculous in Ras Beirut. Some people in the neighborhood -not Itani’s- sit down and smoke sheesha on the side of the road in the mornings. Why not? It’s available and VERY secure. Truth is I have something to say about the security of people on this street, but some other time. One of the shops on the street was a FLOWER shop. It is a sweet thing to have a flower shop close to you. In fact, this flower shop was not only on the same street. It was in the building right next to ours. How good is that? Anytime you feel like it, you can simply pick up a bouquet and go upstairs and present it to your mother, your father, your sister, yourself, or the neighbor. – This guy is just pretending to have his shop open. The landlords filed a lawsuit to end his lease so he’s just here for show. Did you see any fresh flowers in his shop? – Truth is I didn’t look into the shop well. I felt horrible. HORRIBLE. How can a florist, for me almost a sacred being who deals with flowers, these beautiful creatures, how can he be a liar? And it was then that I noted to myself; there is a big difference between a florist, and a guy who sells flowers. So for whoever is doing any research related to this lawsuit, if you’re doing your homework right, you know the real story behind Lebanon Rose now. It withered a long time ago. Just watched Little Miss Sunshine with my beloved students. It made me realize how much I miss the freeways of America. With the trucks, the crazy drivers, the Harley Davidsons, everything. Then I walked down the slums of Hamra. Passed by Cafe Younes and said hello. You always bump into acquaintances at Younes. If you don’t, then you’re not in the art scene in Beirut. I went to Chico and got my weekly dose of DVDs. I passed by tourists at Socrates, smiled to a woman trying to attract customers, and almost bumped into a man selling vegetables. These slums have their joy. When I walk, I see myself from above, a happy carefree soul.